Anyway, the other night I was making my version of their Caesar dressing for my friend Michael and he was like “You need to post this” – So here it is! It’s not typical and the black pepper is really assertive so if you think it might be too much for you try starting off with half the amount. 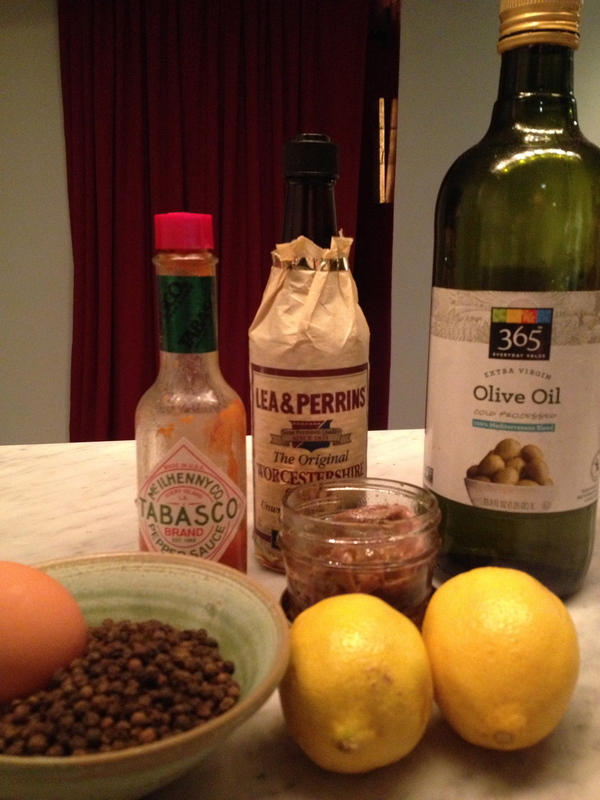 Also from the looks of the ingredients you’d think you were making a fancy Bloody Mary, but no, trust me on this one. I have slightly adapted the recipe from the original. Pus a small pot on to simmer with about 2 cups of water and a tablespoon of white vinegar. Have read at hand a room temperature a large egg cracked open into a small bowl ready to go into the water. In the bowl of a blender add 1 teaspoon of black peppercorns which you have cracked in a mortar and pestle, 5 anchovies that were packed in olive oil and 1/2 cup of olive oil. Puree for several minutes until the peppercorns are finely broken down. Turn off the blender and then add 1 Teaspoon of Celery Salt, 3 Dashes of Tabasco, 3 Dashes of Worcestershire, 2 teaspoons of Dry Mustard powder, 3 large garlic cloves (that you have peel and smashed with the side of a knife) 2 Tablespoons fresh Lemon Juice and 3 Tablespoons of Red Wine Vinegar. Puree for a minute. Place the egg in the simmering vinegar water and cook for a minute and a half until it is poached but the yolk is still runny. With a slotted spoon, lift out of the water and let drain add the egg to the blender and again, puree until the egg is mixed well. Taste the dressing and adjust the seasoning with salt, pepper or a little more lemon juice depending on your desires. Making home made croutons is easy and the best thing for this salad. Really any bread will do but old Brioche or baguette are my favorites. Toss a cup of cubed bread into 1/4 cup of olive oil with some salt and pepper and bake in a 375 F oven until brown and crunchy. Put your warm coutons into a bowl and toss them with a few tablespoons of the dressing, working them well with your fingers to help message in the dressing. Toss 4-6 cups of clean, crisp Romaine lettuce with the dressing along with 1/2 cup of freshly grated Parmesan Cheese garnish with the croutons and eat right away.